A recipe from LEON’s Happy Salads cookbook. If you’re making this the night before, leave the watercress and garnish separate until you’re just about to tuck in. Then get your freekeh on. Cut the ends off the baby parsnip, then chop into quarters. Peel the carrot, halve lengthways, then chop into batons the size of your index finger. Pop the veggies on a baking tray and drizzle with olive oil. Season with a pinch of salt and black pepper. Roast on the top shelf of your oven until golden and slightly crispy, 25-30 mins. Pop a large saucepan of water on to boil (amount specified in the ingredient list) with the vegetable stock pot. Stir to dissolve the stock pot. When the water is boiling, add the freekeh. Lower the heat to medium. Simmer the freekeh until plump and tender, 15-18 mins. When cooked, drain through a sieve then return to the pan, off the heat. While still warm, sprinkle half of the zahtar spice blend over the freekeh. Pop on the lid and leave to one side until ready to serve. Zest the orange (you'll want no more than a teaspoon). Finely chop the dried apricots. Remove the mint leaves. Discard the stalks and finely chop the leaves. Deseed and finely chop the red chilli. Put the yoghurt in a bowl with a pinch of orange zest and a squeeze of orange juice. TIP: How much orange you add is up to you - remember to taste it! Add the cumin, half the apricots, half the mint and half the red chilli. TIP: Add as much chilli as you can handle! Mix this together well and season to taste with a pinch of salt and black pepper. Gently fold the remaining apricots, mint, and a pinch of the leftover chilli into the freekeh. Arrange the watercress on plates, with the zahtar freekeh spooned over. 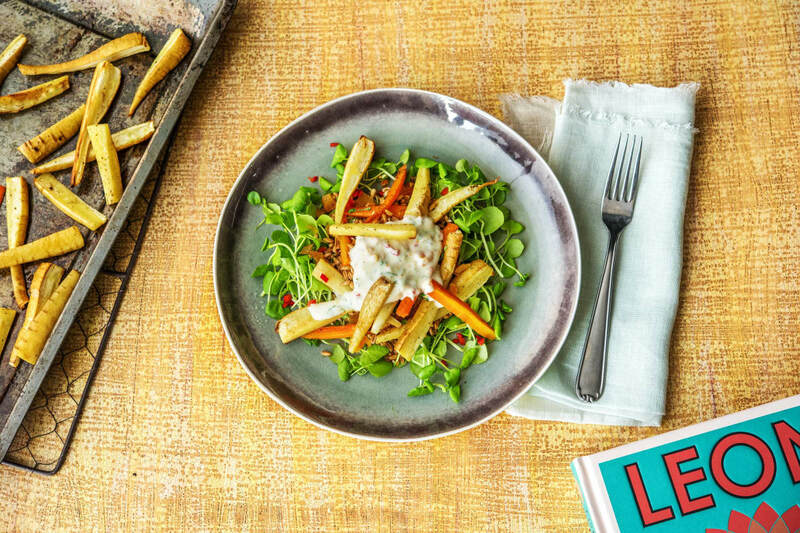 Pop the roasted vegetables on top with a dollop of yoghurt dressing and a sprinkling of the remaining zahtar spice blend.